Wholesale Tire & Automotive of Corona, CA has provided premier automotive services for all makes and models in Corona, CA since 2008. Our ASE Certified technicians have years of experience and training behind them, making them the area’s reliable, skilled and knowledge automotive team. Get your vehicle in with our experts today and get a better picture of its overall health. We perform free diagnostic services to identify any problem areas, worn out parts or inefficiencies. Our team is dedicated to providing accurate and honest repairs, so once we have an idea of the work your vehicle needs, we’ll give you updates and recommendations to improve its performance and your driving experience. Let our expert mechanics get you back on the road today! We look forward to being your trusted auto team! 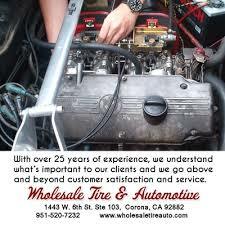 Make Wholesale Tire & Automotive your one-stop shop for all of your vehicle’s automotive needs in Corona, CA. We offer a full range of the repairs and services necessary to protect and restore your vehicle’s optimal performance. Since your vehicle left the manufacturer, aspects of performance, handling and efficiency may have degraded along with worn out parts. Unfortunately, not everything is designed to last forever, that’s why we use original equipment from your vehicle’s factory manufacturer to restore function and protect value. Whether it’s your tires or brakes that have worn past prime conditions, we can make repairs using quality parts replacements. Check out our full list of service offerings below, we are the only place you need for complete automotive care! As a family-owned and operated facility, Wholesale Tire and Automotive understands the pressure auto services put on your family. Being without your vehicle is stressful, which is why you need a team that considers you as much as your vehicle. When you come in for your vehicle’s repair, the first thing you expect is friendly assistance. We put customer service in front of all of our auto services to ensure our visitors are as well cared for as their cars. Don’t let today’s repairs stop you from other plans. We’ll send you status updates on your vehicle to keep you informed on its service. We look forward to your visit!